Whether you’re a new or veteran pet owner, you may be wondering where to find cheap pet supplies to help save money on pet costs! Owning a pet can be costly, not only due to veterinary bills, but also pet supplies themselves. It might not seem like a lot that you need, but if you really sit and break it down, there’s quite a bit you’ll need when owning a pet. You’ll need food and water dishes, toys, treats, and possibly leashes and harnesses, not to mention training collars and anything else you might spoil your beloved fur children with! First things first, you’ll want to search for deals to avoid buying things that are overpriced and marked up. PetSmart, although typically in a higher price range, does have sales pretty often, and if you look for them, you’ll be sure to find the things you want and need for a lower price once they’re marked down. Additionally, they usually have a display near the checkouts with cheaper toys that are around $1.00 and usually pretty good quality. Things in the front displays are usually marked down as well, so anything that you see when you first walk in will catch your eye. They put those first as a marketing tactic to get you drawn in and searching for more deals, so typically you’ll find a pretty good deal on any immediate displays in the front. PetSmart is a great store, but there are also smaller pet stores like Petco, and any local pet stores you might have that supply cheap pet supplies. Local pet stores tend to be either way cheaper than big corporate retail stores like PetSmart, or way more expensive, so it’s kind of a hit or miss! You can also search online for cheap pet supplies in places like Amazon or eBay. Sometimes online vendors get wholesale pricing on things like that and are able to sell them for cheap, so you can land a great deal! Additionally, places like WalMart and Target tend to have a bigger section for cheap pet supplies online than in-person, as their in-person inventory is usually pretty scarce. Look off the beaten path! Additionally, you can check local grocery stores, as most have a small pet supply section and they sometimes have cheap pet supplies. Like any other store, this is hit or miss, as sometimes their prices are much higher. They do tend to have sales on pet supplies though, so just be on the lookout for some sales and you’ll be able to score some cheap pet supplies! Another great source for cheap pet toys is the dollar store. While the toys don’t last long, if you want to give your dog a little surprise, they’re a good option. Where do you shop to find cheap pet supplies? How else do you save money on pet costs? Let me know in the comments below! plans for the future and rather more. 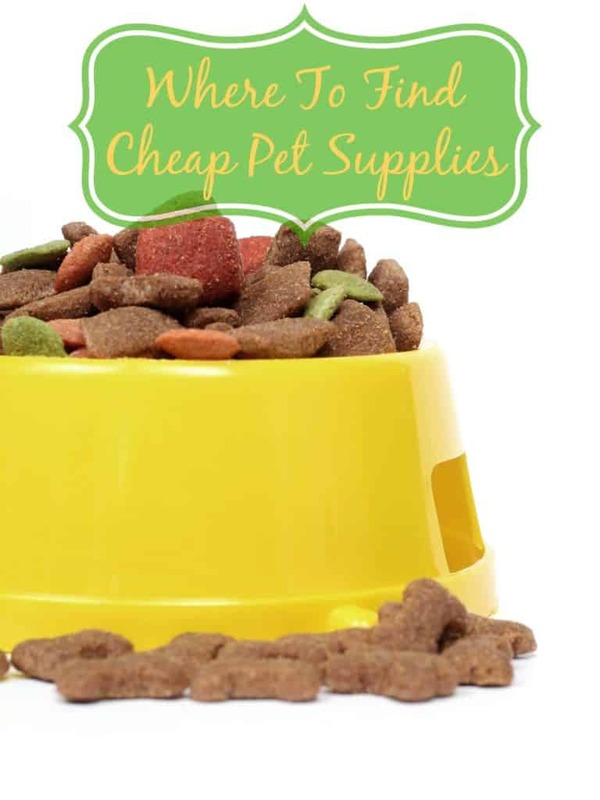 These are great ideas for finding cheap pet supplies. We don’t have any pets, but when I did I remember how expensive it can be. Those are some great ideas. We used to always pick up dog toys at the dollar store. I need to look online more often. I normally just pick things up when I’m out running errands, but I don’t compare prices much. Thank you for the great (and helpful!) tips! We enjoy our trips to Petsmart–and checking out all of their great deals! We used to love going to PetSmart. It’s always nice to see all the fun and useful things they have going on there. Thanks so much for the tips! I’ll pass this onto my cousin who has 2 dogs. These are great ways to save money. Thank you for the tips! We have 4 pets so trying to save money on their supplies is something we are always trying to do. We stock up on toys when they are on clearance after each holiday, sweaters for the dogs at the end of the seasons and always stock up on litter when it is on sale. The one thing we do spend money on is their food, but always take advantage of coupons on it if we can get them. I think No Frills and Walmart has pretty good deals on pet food and supplies. Great tips. Petsmart is crazy expensive! Thanks for the helpful info – we have 2 furbabies, a dog & a rabbit!! We have two large dogs, three cats, two chinchillas and fish..so it can get quite expensive. We buy a lot of the treats they get on sale at petSmart – stock up when they have the good stuff. This is helpful info, I’ve got 2 cats of my own, plus I feed as many as 6 or 7 neglected neighborhood cats and a few dogs daily, so I spend a lot on pet food!